It's National Dog Week: Let Us Know Where You're Dining With Dogs! 1. Introduction: The #DiningWithDogs Giveaway, consisting of a week-long giveaway from September 24th to September 30th 2017. (each, a “Giveaway”), is organized by OpenTable, Inc. (“OpenTable”), located at 1 Montgomery Street, Suite 700, San Francisco, CA 94104. These rules are the terms and conditions of each Giveaway (“Rules”). By entering a Giveaway, you agree to be bound by these Rules. If you do not agree with any of the Rules then you should not enter a Giveaway. 2. Eligibility: You are eligible to enter each Giveaway if you are a resident of the United States and if you are at least 18 years of age. Employees of OpenTable or its affiliates and anyone else professionally connected with the Giveaways, and members of their respective immediate families (to include, parent, sibling, spouse and child) are not eligible to win the Prize(s) (as defined below). Any such entries will be invalid. NO PURCHASE NECESSARY TO ENTER. VOID WHERE PROHIBITED. 3. Entry Period: Beginning September 24, 2017 through September 30, 2017, 12:01 am (PT) and will end at 11:59 pm (PT) (each, an “Entry Period”). 4. 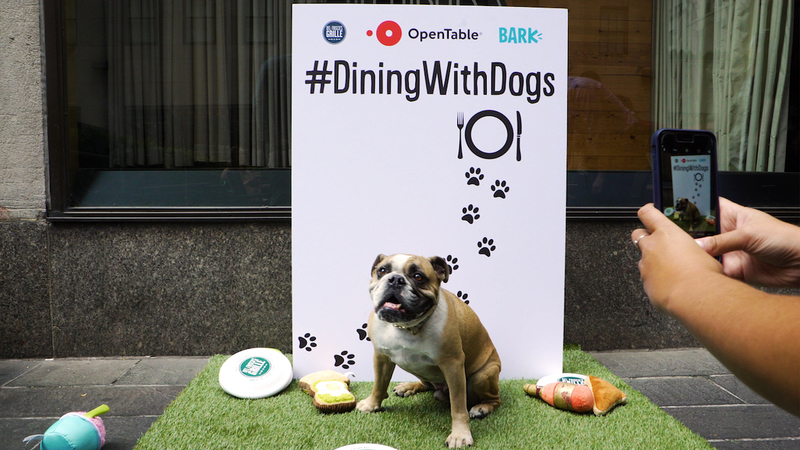 How to Enter: To enter a Giveaway, during the applicable Entry Period, (i) Follow @OpenTable on Instagram, (ii) share a picture dining with a dog at a restaurant, and (iii) use #DiningWithDogs. You must have a public account on Instagram to enter. Limit one entry per Entry Period. Proof of posting will not be considered proof of receipt. Any use of robotic, automatic, programmed or similar entry methods will void all such entries by such methods. You must have an Instagram account in order to enter via Instagram. Instagram is free to join. 5. Winner Selection: During the entry period, five (5) winners ( a “Winner”) will be determined by a random drawing from among all eligible entries received. OpenTable’s decision is final and binding in all matters relating to the Giveaways. Odds of winning depend on the actual number of eligible entries received. Potential winners will be notified through Instagram. If a potential winner is unreachable for 24 hours after the first attempt to contact such winner or is unable to attend, OpenTable may award the Prize(s) to an alternate entrant. To claim the Prize(s), a Winner must complete and sign an “Affidavit of Eligibility and Liability Release” within 48 hours of notification, or an alternate winner may (in OpenTable’s sole discretion) be selected. OpenTable’s computer shall be the official timekeeper for all matters related to the Giveaways. 6. Prize: Each Winner will receive a gift from BarkBox + a $100 Visa Gift Card (approximate retail value: $150) (the “Prize”). The Winner(s) will not receive the difference between actual and approximate retail value. No cash equivalent or alternative prize will be given and Prize(s) is non-transferable and non-exchangeable, except in OpenTable’s sole discretion. All taxes and other expenses, costs, or fees, including transportation, and accommodations associated with the acceptance and/or use of any prize are the sole responsibility of the Winner(s). OpenTable will not be responsible for any loss, liability or damage arising out of any Winner’s acceptance or use of any Prize. 7. Winners List: To receive a list of Winners for a Giveaway, send a self-addressed, stamped envelope to OpenTable, Inc., Attn: Marketing Department — #DiningWithDogs, 1 Montgomery Street, Suite 700, San Francisco, CA 94104. Requests for results must be received within 60 days of the close of the applicable weekly Giveaway. 8. Conditions: By entering any Giveaway, you hereby warrant that all the information submitted by you is true, current and complete. OpenTable reserves the right to ask for proof of age and evidence to verify the identity of an entrant at any time, and may carry out checks of any details provided. All entries become the property of OpenTable and will not be acknowledged or returned. You must have the permission of any person that you identify or otherwise refer to in your entry. By entering any Giveaway, entrants grant OpenTable the non-exclusive, royalty-free, and irrevocable rights to use, reproduce, copy, publish, display, distribute, perform, translate, adapt, modify, and otherwise exploit the entry and to incorporate the entry in other works in any and all markets and media worldwide in perpetuity without additional compensation, notification, permission or approval. Entrants warrant that they have the sole and exclusive right to grant such rights to OpenTable and that OpenTable’s reproduction, publishing, displaying, and/or other use of the entry will not infringe on any rights of third parties, including, without limitation, copyright, trademark, privacy, or publicity, or create claims for defamation, false light, idea misappropriation, intentional or negligent infliction of emotional distress, or breach of contract. If any entry contains material that is offensive, violent, pornographic, obscene, illegal, inappropriate, or racially or morally offensive or if any entry does not comply with these Rules or meet OpenTable’s standards for any reason, as determined by OpenTable in its sole discretion, such entry may be rejected as ineligible for consideration and/or deleted. Entries must comply with all applicable laws, rules, and regulations. OpenTable shall have no obligation to copy, publish, display, or otherwise exploit the entry. In the event of any fault, mistake, misunderstanding or dispute concerning the validity of the information supplied by the entrant, or the operation of any part of any Giveaway, the decision of OpenTable shall be final and no correspondence will be entered into. 9. Liability and Release: OpenTable does not accept responsibility for any fault, malfunction, damage, loss or disappointment suffered by any entrant howsoever arising from participating in any Giveaway or of accepting any prize whether due to any error, omission or other cause by OpenTable, its employees, agents or others to the fullest extent permitted by law. By entering any Giveaway, each entrant agrees for entrant and for entrant’s heirs, executors, and administrators (a) to release and hold harmless OpenTable and its promotional partners, and their respective subsidiaries, affiliates, directors, officers, employees and agents, and Instagram (collectively, “Released Parties”) from any liability, illness, injury, death, loss, litigation, or damage that may occur, directly or indirectly, whether caused by negligence or not, from such entrant’s participation in any Giveaway and/or his/her acceptance, possession, use, or misuse of any prize or any portion thereof; (b) to indemnify Released Parties from any and all liability resulting or arising from any Giveaway and to hereby acknowledge that Released Parties have neither made nor are in any manner responsible or liable for any warranty, representation, or guarantee, express or implied, in fact or in law, relative to prize; (c) if selected as a winner, to the posting of such entrant’s name and/or blog user name on the OpenTable website and the use by Released Parties of such entrants name, voice, image, and/or likeness for publicity, promotional, and advertising purposes in any and all media now or hereafter known, throughout the world in perpetuity, without additional compensation, notification, permission, or approval, and, upon request, to the giving of consent, in writing, to such use; and (d) to be bound by these Rules and to waive any right to claim any ambiguity or error therein or in any Giveaway itself, and to be bound by all decisions of OpenTable, which are binding and final. Failure to comply with these conditions may result in disqualification from any Giveaway at OpenTable’s sole discretion. THE REMEDY FOR ANY CLAIM SHALL BE LIMITED TO ACTUAL DAMAGES, AND IN NO EVENT SHALL ANY PARTY BE ENTITLED TO RECOVER PUNITIVE, EXEMPLARY, CONSEQUENTIAL, OR INCIDENTAL DAMAGES, INCLUDING ATTORNEY’S FEES OR OTHER SUCH RELATED COSTS OF BRINGING A CLAIM, OR TO RESCIND THIS AGREEMENT OR SEEK INJUNCTIVE OR ANY OTHER EQUITABLE RELIEF. 11. Organizer: The sponsor of the Giveaways is OpenTable, Inc.
12. Non-Affiliation: The Giveaways is in no way organized, sponsored, endorsed, or associated with Visa or Instagram. You must abide by Instagram’s terms and conditions. 13. Governing Law: The Giveaway shall be governed by and interpreted under the laws of the State of California, U.S.A. without regard to its conflicts of laws provisions. The Federal and State courts located in the county of San Francisco, California will be the exclusive venue for any disputes under any Giveaway, and you hereby consent to the personal jurisdiction of those courts for such purposes. 14. Additional Terms: OpenTable reserves the right to permanently disqualify from any Giveaway or any other promotion any person they believe has intentionally violated these Rules. Any attempt to deliberately damage any Giveaway or the operation thereof is unlawful and subject to legal action by OpenTable, who may seek damages to the fullest extent permitted by law. OpenTable shall have no responsibility or liability for cancellations, delays, or any other change by any company or person providing any element of prize due to reasons beyond OpenTable’s control, and is not responsible or liable for any expenses incurred as a consequence thereof. The failure of OpenTable to comply with any provision of these Rules due to an act of God, hurricane, war, fire, riot, earthquake, terrorism, act of public enemies, actions of governmental authorities outside of the control of OpenTable (excepting compliance with applicable codes and regulations), or other “force majeure” event will not be considered a breach of these Rules. Released Parties are not responsible for telecommunications, network, electronic, technical, or computer failures of any kind; for inaccurate transcription of entry information; for errors in any promotional or marketing materials or in these Rules; for any human or electronic error; or for entries that are stolen, misdirected, garbled, delayed, lost, late, damaged, or returned. OpenTable reserves the right to cancel, modify, or suspend any Giveaway or any element thereof (including, without limitation, these Rules) without notice in any manner and for any reason (including, without limitation, in the event of any unanticipated occurrence that is not fully addressed in these Rules). In the event of cancellation, modification, or suspension, OpenTable reserves the right to select winners in a random drawing from among all eligible, non-suspect entries received prior to the time of the event warranting such cancellation, modification, or suspension. Notice of such cancellation, modification, or suspension will be posted on OpenTable’s website. OpenTable may prohibit any entrant or potential entrant from participating in any Giveaway, if such entrant or potential entrant shows a disregard for these Rules; acts with an intent to annoy, abuse, threaten, or harass any other entrant, OpenTable, or OpenTable’s agents or representatives; or behaves in any other disruptive manner (as determined by OpenTable in their sole discretion). OpenTable reserves the right to modify these rules for clarification purposes without materially affecting the terms and conditions of any Giveaway.